How about an easy dessert made of a fresh fruit poached in homemade syrup and topped with chocolate sauce? We have a sweet seasonal recipe for you that will dazzle your guests! The main season for pears starts in September so it’s a perfect time to try our poached pear recipe and enjoy a delicious “pear Belle-Helene” (poire Belle-Hélène). But who is this beautiful Helen whose name inspired this classic fall dessert? Truth be told, the pear Belle-Helene dessert is actually named after the operetta “La Belle-Hélène” (The Beautiful Helen) by Jacques Offenback that played in Paris in the late 19th century — not a pretty chef named Helen. But if your name is Helen, it’s still lovely to have a dessert with your name on it, enjoy! This poached pear recipe makes a wonderful dessert and counts for a dose of fruits so we’ll take it! You can also prepare the pears ahead of time – always a plus. Check out our elegant poached pear recipe below and Art of the Home suggestions for our 5-minute version of pear Belle-Helene. Enjoy and bon appétit! 4 pears type Bosc or Conference — will hold well after cooking. Optional: a handful of thinly sliced almonds (toasted or not) – about 4 Tbsp. In a pot large enough to hold the pears in a single layer, prepare syrup by dissolving sugar (granulated and vanilla sugars) in the water. Bring the syrup to a gentle boil and poach pears for about 15 min. With a knife, carefully check that the pears are tender and soft enough so it can be scooped easily with a dessert spoon. Take pears out of the syrup and strain. Dry up thoroughly. Let cool outside or in the fridge. Right before serving your dessert, prepare your chocolate sauce by melting the chocolate in a bain marie. This is a tricky part so to make sure you don’t burn the chocolate, be sure to check Art of the home tips on how to melt chocolate in a bain marie. Add the softened butter to the bain marie and mix it with the melted chocolate until you get a smooth shiny mixture. 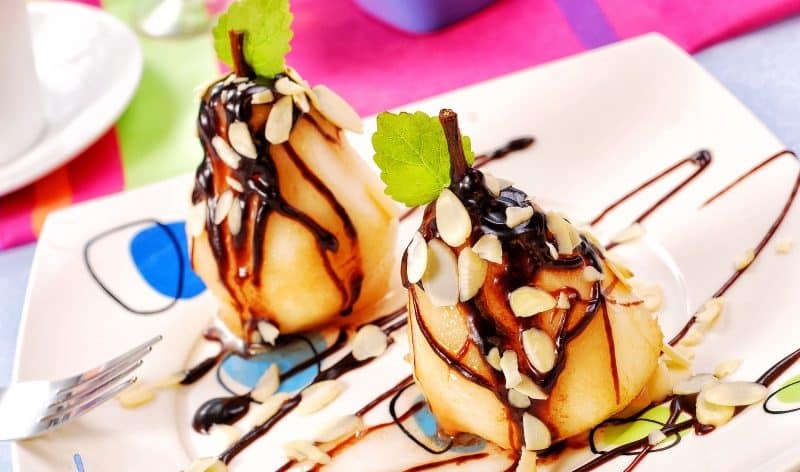 Place each pear in a dessert plate and pour chocolate sauce on top of each cold poached pear. Top each pear with toasted almonds. And voila! Ice cream treat: serve with a vanilla ice cream scoop or a scoop of Chantilly cream. Low fat poached pear recipe: give your guest the choice and serve the hot chocolate sauce in a sauceboat so you can put as much chocolate as you wish or skip it if you want to enjoy your pear belle-Helene “nature” (as-is). 5-minute poached pear recipe: if you don’t have fresh pear handy, you can buy a jar of whole pears already marinated in syrup and start the recipe in Step. 4. And to get in the spirit of making this delicious poached pear recipe, how about listening to the overture of the operetta it is named after “La Belle-Hélène.” Enjoy!